Everyone is running around trying to find the perfect gifts for their loved ones. There's no denying that giving and receiving presents makes up a huge part of Christmas. Making your wrapping look that little bit more luxurious can make opening presents something really special. There are so many ways to jazz up your presents. 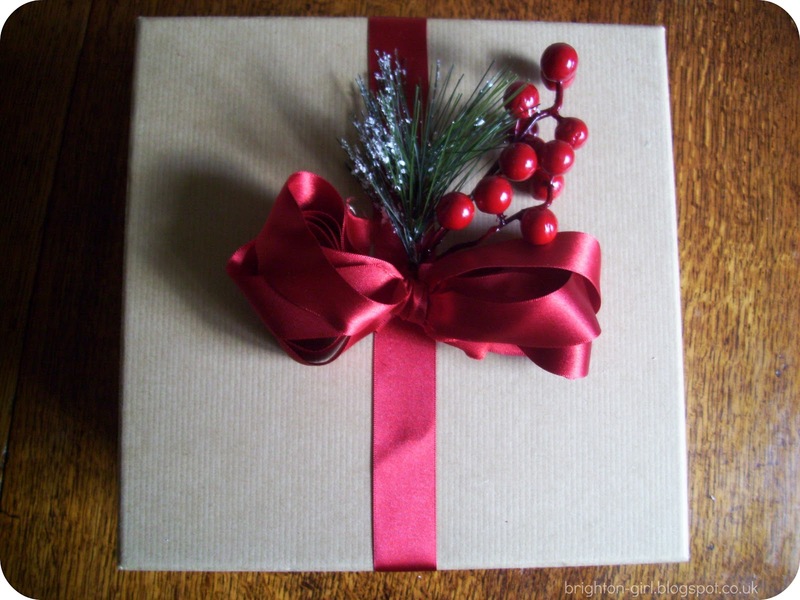 I made a board on Pinterest of some ideas for this year’s Christmas wrapping, you can take a peek by clicking here. 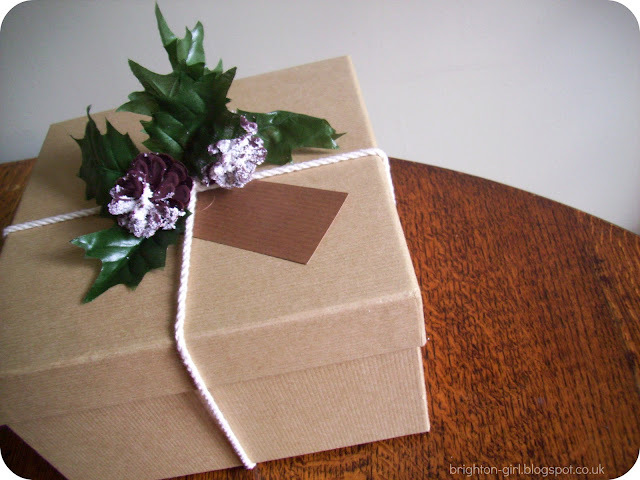 I really like the simple and natural looks and have created some wrapping embellishments to share with you. I picked up the wreath from Poundland and the tags were 65p from Wilkinsons. 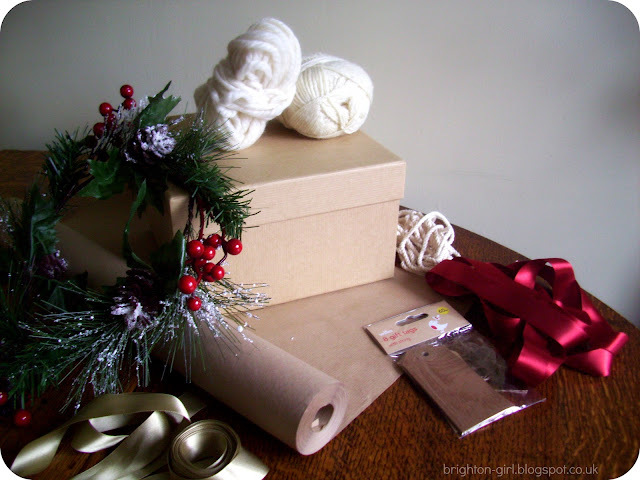 The ribbon, rope and wool are things that I found in our craft drawers, but they can be picked up inexpensively too. The brown paper box is from Paperchase and is perfect for those items that are an awkward shape! I simply snipped off the berries, fir cones and snow-covered fir branches to use as decorations. I just bound the ends up with ribbon and secured with a blob of glue from a glue gun. Any messy bits can be easily covered up with a ribbon! There are loads of different tutorials on how to make your own bows on Pinterest too. Another quirky way to dress up your gifts is to pop a pompom on them! A friend did this one year and it looked really adorable. Pompoms are so much fun to make...and simple too! All you need to do is cut out two Polo shapes from cardboard and wind your wool around them, until you have plenty of layers around the cardboard disks. Pop a length of wool between the two disks and tightly tie a knot. 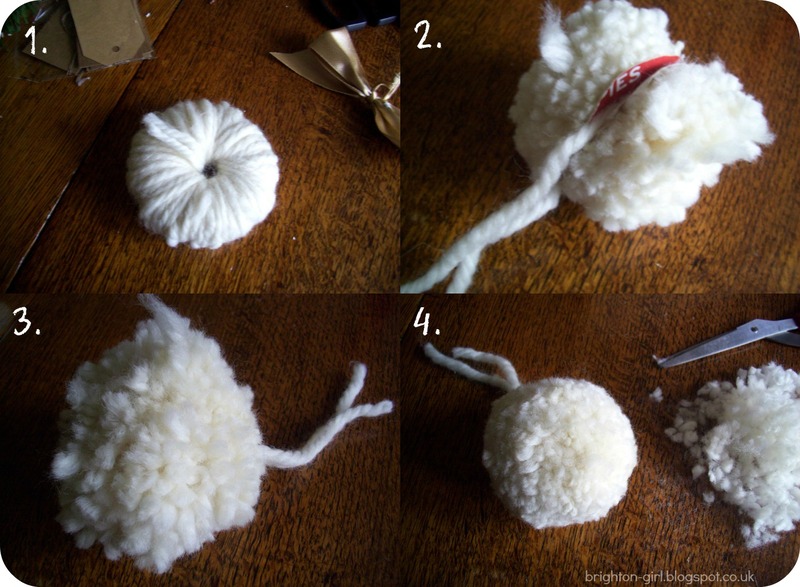 You'll then need to give your pompom a bit of haircut to tidy it up a bit and make it look more spherical. I really love that it makes the box look like a bobble hat! 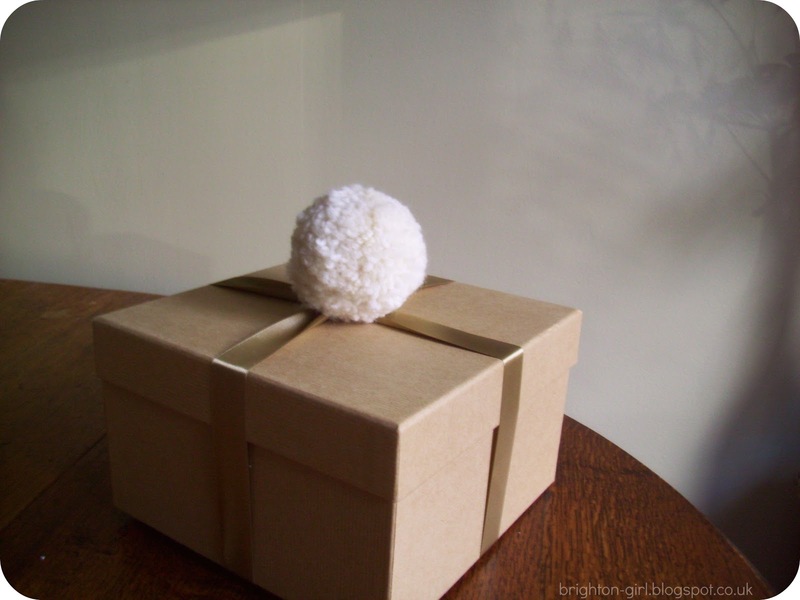 I think a pompom would be the perfect thing on top of a present wrapped in some fair-isle paper! So there you have it. Two ways to make your presents this year a bit more special! 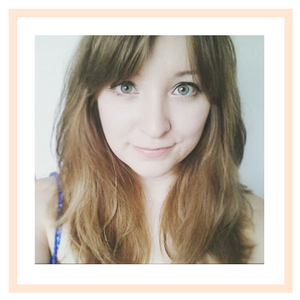 I hope I've given you a bit of inspiration. There are so many other ways to do this too, such as adding some lacy ribbon, bakers twine or washi tape to your gifts. Will you be giving these ideas a go, or have you already got all your presents wrapped? These ideas are wonderful. I'm only just getting the hang of wrapping presents well but will try and incorporate some of these ideas this Christmas! There are so cute! I'm not a very gifted wrapper unfortunately, as I lack patience, but I love these...especially the pompom! Such cute idea, i love them. An early Merry xmas to you.